Aloe Ferox Eye Cream is a natural fragrance-free skincare product which helps to keep your eye area supple, delaying the appearance of wrinkles, fine lines and reduce puffiness. Harnessing the hydrating power of Aloe Ferox the plant, is Aloe Ferox Eye Cream. Natural & fragrance-free. A skincare product which helps to keep your eye area supple, delaying the appearance of wrinkles, fine lines and reduce puffiness. 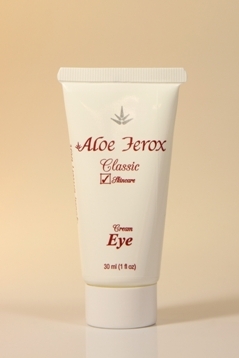 Aloe Ferox Eye Cream improves the rejuvenation of your skin. An essential part of your skincare routine, it helps to protect the elasticity of your under-eye area while preventing dehydration. It helps to improve blood flow to the skin (for improved oxygenation and hydration). Another plus? It’s fragrance-free (as is the Eye Gel), which will be a relief if you have experienced itchiness, runny eyes or puffiness in the past using perfumed eye products which may have caused sensitivity. As you know, the delicate skin surrounding the eye needs special care because the skin is thinner than the rest of the facial skin and also retains less moisture. Your eyes have fewer oil glands than the rest of your face, which results in dryness. Plus there is no fatty layer beneath the skin to absorb shock. The result is that the skin loses elasticity easily. Cleanse your facial and eye area gently. Avoid the eye area when applying toner. Apply Aloe Ferox Super Aloe Gel to the entire face and eye area. Dot Eye Cream lightly with ring finger to the bony area around the eye without rubbing. 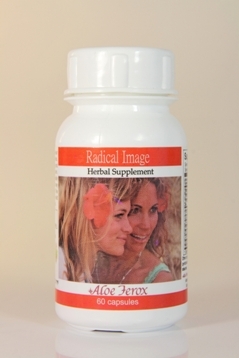 Supplement your diet with Radical Image a natural herbal supplement which will provide important nutrients for enhancing your complexion. Apply your moisturiser after Super Aloe Gel.